You'll be £30.00 closer to your next £10.00 credit when you purchase Seaforth World Naval Review 2013. What's this? Launched in 2009, this annual has rapidly established a reputation as an authoritative but affordable summary of all that has happened in the naval world in the previous twelve months. It combines the standing features of regional surveys with one-off major articles on noteworthy new ships and other important developments. Besides the latest warship projects, it also looks at wider issues of importance to navies, such as aviation and electronics, and calls on expertise from around the globe to give a balanced picture of what is going on and to interpret its significance. Planned special features for this year include in-depth studies of the navies of Italy and Ireland, plus analyses of significant new warship classes: the French Aquitaine class frigates, Indian Shivalik class Project 17 frigates, and US Bertholf class national security cutters. For anyone with an interest in contemporary naval affairs, whether an enthusiast or a defence professional, this annual has become required reading. The review is gaining in reputation with an expanding readership. Laid out to Seaforth’s high standard. A must for those wishing to keep up with world naval affairs. The Seaforth World Naval Review fulfils an important function in faithfully presenting a genuinely worldwide perspective on the subject. Long may it continue to do so. This World Naval Review, first published in 2009, goes from strength to strength. As stated in previous reviews in ‘Scuttlebutt’ Seaforth’s World Naval Review is the ideal companion piece to the standard international reference work Jane’s Fighting Ships and is considerably cheaper. For the busy person who does not have time to plough through the mass of data in Jane’s, and make their own analysis, this fourth edition with its selective, executive style overview, does it for them. The review is gaining in reputation with an expanding readership and it is now being co-published with the US Naval Institute Press. The 2013 edition, edited by Conrad Waters and written by an impressive group of international contributors, including Norman Friedman and David Hobbs is again divided into World Fleet Reviews, Significant Ships and Technological Reviews. Again the book is laid out to Seaforth’s high standard and has many data tables and clear summary boxes. This review is a must for those wishing to keep up with world naval affairs. Waters has the ability to compact a great deal of analysis into a small space. The World Naval Review possesses significant strengths. It provides a high level of basic fleet composition across the world. More significantly, it provides a critical essay on all major navies, their strengths, weaknesses and challenges, new developments and an assessment as to operational effectiveness. I would recommened aquiring the World Naval Review annually, as it provides analysis, context and is well written, illustrated and relevant. 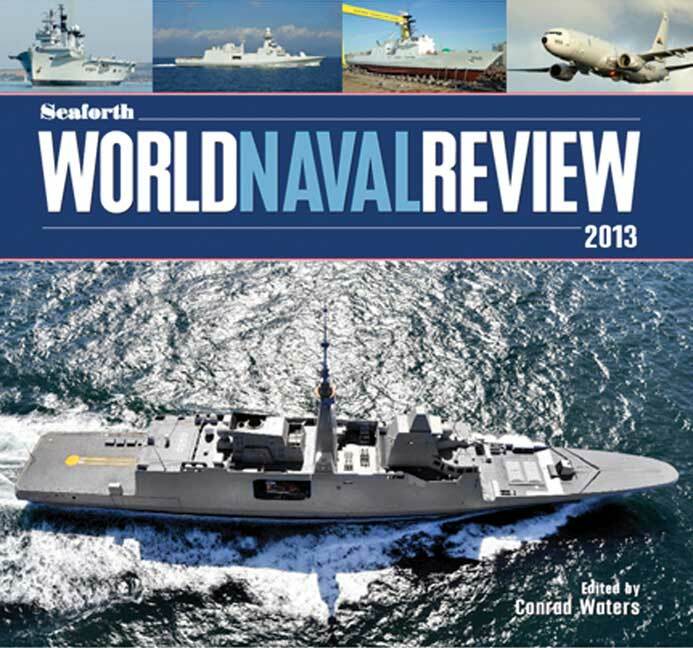 The 2013 edition of the Seaforth World Naval Review includes four articles on significant ships, respectively; French Navy, US Coast Guard, German Navy and Indian Navy. The reviews and articles are insightful and increasing coverage is being given to unmanned and autonomous vehicles. This annual publication, now in its fourth year, maintains both its format and standard. These books are good value for money and well worth reading. Seaforth World Naval Review, now in its fourth year of publication, aims to provide an authoritative, well-illustrated but affordable overview of key developments in the naval world over the previous year.